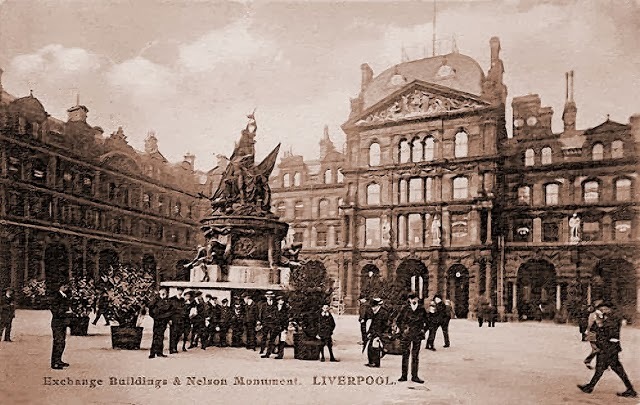 In 1805, Liverpool City Council resolved to commemorate Nelson's victory at the Battle of Trafalgar by erecting a monument and voted to pay £1,000 towards its design and construction. A public subscription fund was launched and within two months a total of £8,930 (£610,000 as of 2014) had been reached; this included £750 from the underwriters at Lloyd's and £500 from the West India Association. It was agreed that the monument should be located in a prominent site near the Exchange. A competition for its design was arranged, and this was won by Matthew Cotes Wyatt, son of James Wyatt, the contract being signed in 1809. Matthew Wyatt was relatively inexperienced, and was assisted by Richard Westmacott. The first stone was laid on 15 July 1812, and the monument was unveiled on 21 October 1813, the eighth anniversary of Nelson's death. 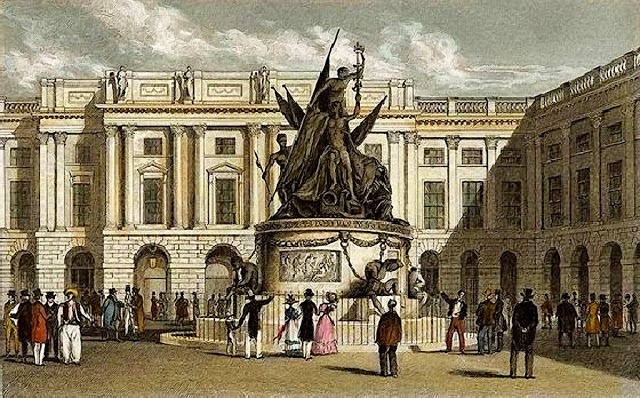 In 1866 the monument was moved to its present site in Exchange Flags to allow for an extension to the Exchange Buildings, and the Westmorland stone base was replaced by one in granite. The War Memorial in Exchange Flags was funded by subscriptions raised among members of the Liverpool Royal Exchange Company and was designed in 1916, initially dedicated to those members of the company and their sons who had enlisted. By the time of the final unveiling in 1924 it had also become a memorial to the war dead of the Liverpool Exchange Newsroom and their sons. 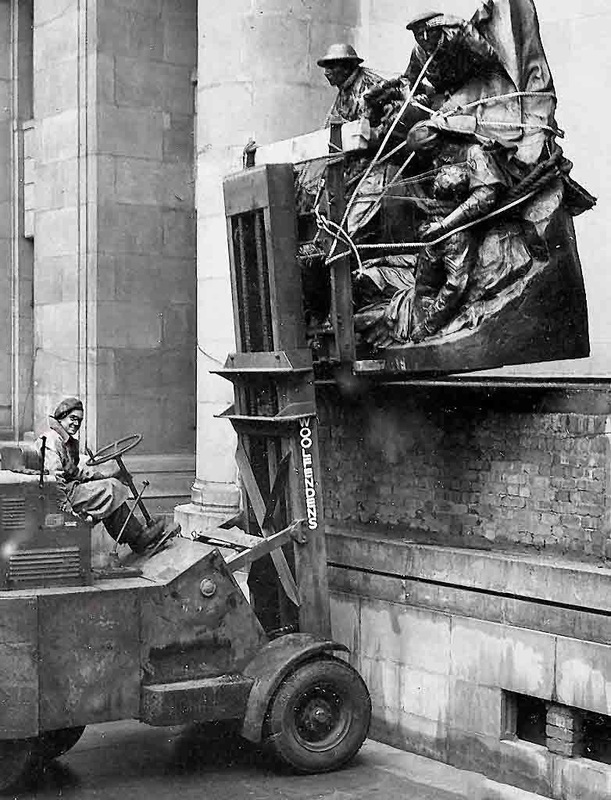 In 1953 the memorial was moved to its present location from the old Exchange News Room, and placed between piers supporting stone sculptures by Siegfried Charoux. 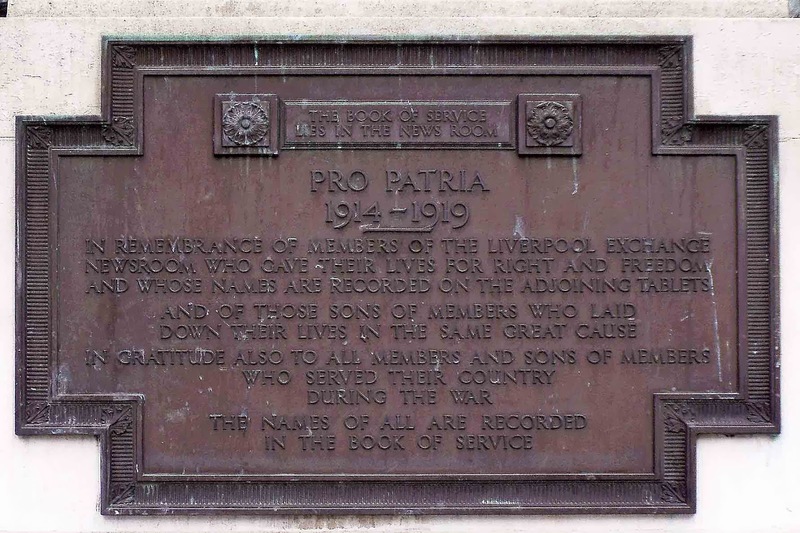 The figures of a family were designed at the express wish of the directors of the Liverpool Exchange Company in order to bring in some reference to the civilian war effort. It contains the bunker housing the World War II military command headquarters known as Western Approaches Command Headquarters. The Battle of the Atlantic, one of the pivotal campaigns of the war, was planned and directed from the Western Approaches Command Headquarters in Liverpool, making it of national historic interest. The bronze war memorial by Joseph Phillips was begun in 1916 and is arguably the first ever World War I memorial. The memorial is a well-planned and executed composition, both heroic, with the depiction of armed service men culminating in a triumphant figure of Britannia at its apex, and humane, with the inclusion of a small girl and a nurse tending a wounded soldier. 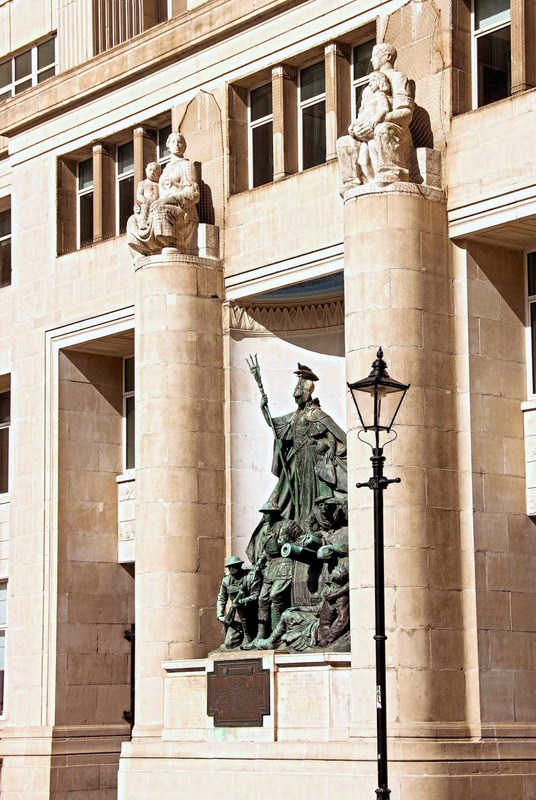 The memorial is set in a purpose-designed niche in the centre of the main south elevation, flanked by engaged columns supporting stone sculptures by Seigfried Charoux, and facing the Grade II. Nelson Monument in the centre of Exchange Flags.